Jenrry Mejia, a name that has drawn a lot of attention this past week down in Port St. Lucie, Fla., is just one of the many unexpected developments to come out of Mets camp. Mejia, a twenty-year-old right hander who hails from the Dominican Republic, has been able to put a lid on his control problems, allowing his raw talents to take their proper course. Mejia has electric stuff. He throws a 96 mph fastball with a lot of movement that can make even the most talented hitters miss. 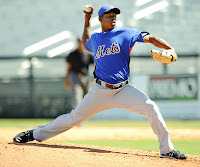 In two-and-a-third innings of work on Friday, Mejia managed to strike out four of the seven batters he faced. In addition to a high-octane fastball, he also has a changeup and what scouts are calling a decent curveball. Fortunately for Mejia, possessing a naturally cutting fastball could very well be all the juice he needs in landing a role as the Opening Day set-up man for closer Francisco Rodriguez. With Mejia as a formidable front runner for that position, Mets manager Jerry Manuel is faced with an even more difficult task if and when he decides on who will be the eighth inning guy out of the bullpen. “What he has to do is prove that for the most part he can throw consistent strikes. If he can do that, he’s got somebody fighting for him,” Manuel said. On a down note, shortstop Jose Reyes was scratched from his scheduled start in Friday’s split-squad matchup at Tradition Field against the Marlins. The Mets lost that game, 4-3, when Florida’s Mike Stanton crushed a 2-run HR off of Bobby Parnell in the 10th inning. Reyes, on the other hand, was diagnosed with an imbalanced thyroid that doctors later classified as overactive. According to the NY Times, the symptoms associated with this condition include loss of weight, hyperactivity, bulging eyes, and excessive sweating. However, Reyes has confirmed none of those symptoms. In spite of how he feels, the Mets have taken the proper precautions. Reyes will be retested in New York on Monday, delaying those results until Wednesday. Doctors have suggested that the Mets catalyst may be sidelined for up to a month as he is monitored and receives the necessary treatment. “I don’t know what’s going on, this is the first time I’ve ever had something like this,” he added.